← Happy Bloggiversary to Me! Something unexpected happened early in the summer- something that had not happened since 2002. For the first night in eight and a half years, my husband and I had no kids in the house. My two girls were visiting their aunt in Tyler, Texas, and my son was spending the night at a friend’s home. I was relishing the thought of a guaranteed night of blissful, uninterrupted sleep. At ages 8, 6, and 4 my kids are pretty good sleepers, but at least once a week someone has a bad dream (Emily), decides that 3:00 is technically morning and has to be put back to bed (Katie), or gets a touch of insomnia (Caleb).I was looking forward to that quiet night. All was going according to plan. The husband and I got to go to dinner and a movie, went to bed in the strangely peaceful house, and drifted off to a quiet, seamless slumber. It was beautiful. Until…. I was awakened at 2:30 by ferocious, hysterical barking in our yard. Our two big dogs are not barkers. We do not allow it. Most late night backyard barks that come wake me enough to think “Man, I hope they stop that…”, and they do before I finish the thought. Once in a while, they bark enough that I have to get out of bed and go tell them to knock it off. Which they do, with guilty doggy looks on their faces. This barking, however, was the kind that made me leap immediately out of bed and race down the stairs because I knew something or someone must be in the yard. I opened the back door and could not immediately see them. They were around the corner, fighting with…. something. 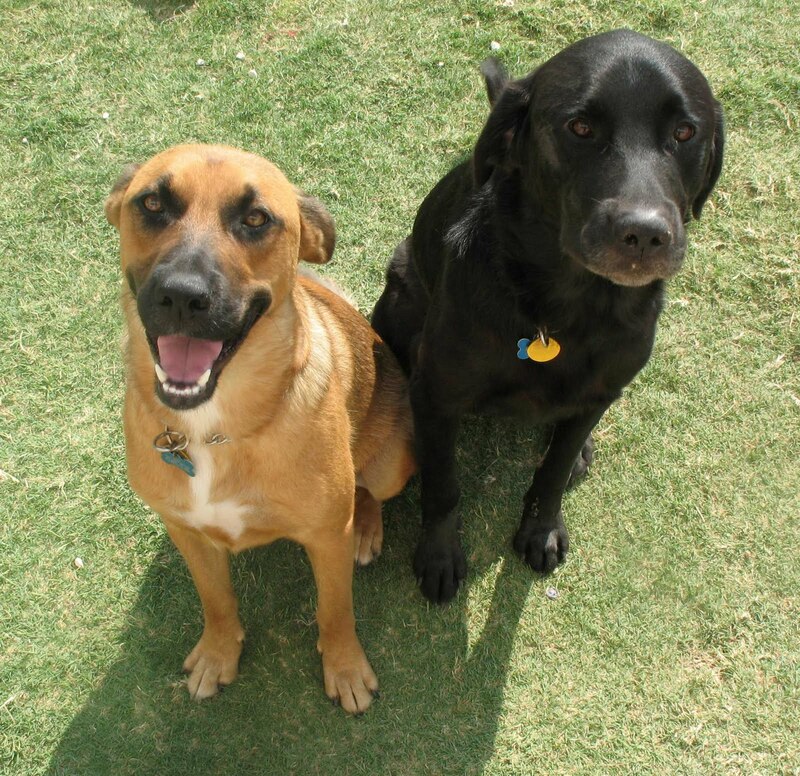 I called them, and Scout, the 80 lb black lab, ran halfway over to me, then turned around and went back into the fray. Max, 60 lbs of mongrel mutt, ignored me completely. I ran back in for my shoes and hollered up the stairs for Rusty to come help. Whatever it was, the boys had it trapped under the playscape’s plastic slide. I caught Scout by the collar, but Max would not come out from under the slide enough to be grabbed. Rusty hauled him out by his tail, and we locked them in our garage. Grabbing a flashlight, we headed out to see what their mighty foe was. What are the odds that the one night all three of my kids were out of the house, our two dogs would accomplish the impossible. They had finally caught the cat that had been mocking them from a treetop for months. That cat was stupid enough to get in reach of the two dogs he loved to torment, and my boys had made him regret it. That was a problem. The cat wouldn’t run for his life, and we couldn’t put the dogs back out and go back to bed until he did. “Shoo! Shoo, kitty!” I urged him. He stared up at me, hunkering farther down. “Go get your shovel,” I told Rusty. “Give him a nudge and he’ll run.” Rusty got his shovel, nudged the shocked cat, but he only ran about 5 feet then glowered up at us again with scared, hateful eyes. “Well, he’s not too hurt to run. I think he is just too scared,” Rusty said. “But we can’t let the dogs out and go to bed until he leaves!” I replied. Rusty nudged him again, a little more forcefully, and the cat skittered a few feet and growled menacingly. From his movements he really did not seem hurt, just very scared and angry. Rusty looked at me, looked at the cat, and then looked at the fence behind our house. There was nothing but cow pasture on the other side of the fence. “I could toss him over the fence with the shovel,” he finally said, testing the idea. “That’s a good idea. He’ll probably run for it once you pick him anyway,” I agreed. 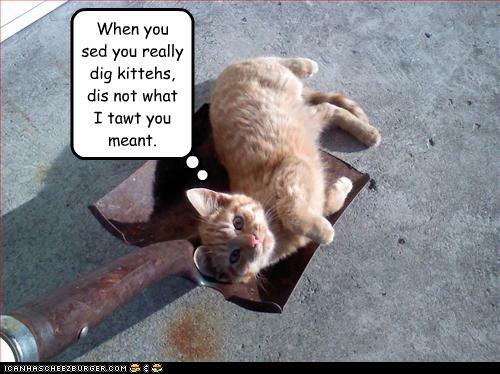 I was wrong, though.That cat just clung to the shovel for dear life. With a grunt and a mighty heave, Rusty flung the cat up and over the 6 foot fence. For just a second, the cat was silhouetted against the moon, let out a betrayed “Raawwwrr?”, and then he was gone. We let the dogs back out and watched as they raced thought the yard, looking for their prize, coming back to us in disappointment. “Goodnight, boys,” I patted them as we headed inside and back to bed. By this time we were wide awake, and sleep did not come for at least an hour. We would start to get quiet and settle down, but then I would be overcome by giggles, unable to erase the thought of the cat flying over the fence. So much for the much anticipated night of deep sleep. A few days later I saw the cat far across the street from my house. I was glad to know he survived relatively unscathed. He gave a wide berth to the home of those ferocious dogs and the crazy, shovel-wielding man.